Take a look at our TripAdvisor page too. You can see what others say and post your own review and comments. We love hearing for our visitors. Aloha, I'm sitting here drinking a hot mug of Puna Coffee....amazing, brings tears to my eyes! I recently visited your website and noticed the Puna Estate is temporarily out of stock. Do you know if/when it will be available again? It is perhaps the best coffee my husband and I have had and I imagine it must be quite popular. Mahalo for getting the coffee here in time for my husband's birthday. When he saw the package, he got a grin from ear to ear. He'd never tried the Puna coffee before so he was so excited. We're sitting here right now drinking it and it is truly excellent. Many, many thanks! Thanks not just for the wonderful coffee - thanks also for the great service! I just wanted to let you know that we will never forget you. The time you took out of your day to share with us will be forever appreciated. You were so kind, inspirational and your passion was felt. You made our trip to the big island that much more memorable. 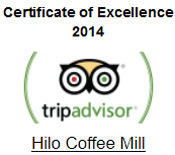 We wish you and Hilo Coffee Mill the best, but we are confident Hilo Coffee Mill will be a huge success. We have been drinking coffee at every coffee company we can find from Kona to Hilo, Princeville to Waimea. Your product is unmatched, your coffee was definitely the best! We just wish we had bought more coffee from you to take back home to share with our family and friends! I just wanted to thank you for the time you spent with us and the love you showed to complete strangers. I hope one day I can inspire people by living out one of my dreams. Our Hawaiian experiences have brought more pleasure than any other travel adventure. Hilo Coffee Mill tops the list and WE WILL BE BACK! Mahalo! My husband and I were able visit the Coffee Mill while on a tour from our cruise ship on Sunday, February 8th. We enjoyed the whole experience and learned so much about coffee. Prior to our visit that morning we were ignorant coffee drinkers. Our guide, Tammy, told our group that you opened special for us and we were so happy you did. We had you send us coffee for when we returned to Texas. It arrived on time and we have been enjoying our Hawaiian coffee while reflecting on the experience which reminded me that I wanted to e-mail you and let you know that our visit there was one of the highlights of our entire Hawaiian trip. Also, I understand that you provided our box lunch for the volcano tour. I just want to say that was not what we expected; that was an excellant lunch-thank you! During our last trip to Big Island we got to try your coffee - which overwhelmed us! Less acid - more taste - compared to the Kona side. 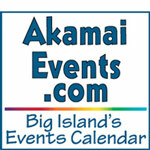 About us: We are German - and simply love Big Island - and hopefully will come for another stay in February next year. Many thanks for the time you gave to us and our good friend Paulette today talking about coffee, roasting, your business, and sharing that great coffee and soup!! We got our money’s worth many times over! 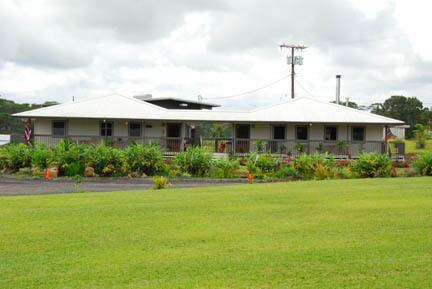 On a trip to the Big Island about a year ago with my girlfriend we stayed in Hilo. This was our second trip to the Big Island together and made it a point to stay in Hilo for most of the time. It is our favorite side of the island. We stayed at a cottage and made it a point to get most of the food we prepared from the local grocery store or from the Hilo Farmers Market. It was at the farmers market that we discovered your coffee. It was being manual pressed by this guy running a coffee cart at the market. I forget his name but remembered how good that coffee was. I had him do a double americano and also a double espresso. Man that coffee was excellent! I received a tremendous Christmas gift this year; and would like to inquiry, as to how to order it from you…"Big Island Buzz. "Thus, the question:Do you have this variety of coffee?If so, may I order it? EVERY DAY AT BREAKFAST I THINK OF YOU WHEN I HAVE MY COFFEE THAT I BOUGHT WHEN I STOPPED IN 2 WEEKS AGO WITH MY PARTNER. WE WILL BE BACK IN KONA THIS SUMMER FOR A MONTH/WE RENTED A CONDO AND WE WILL RETURN FOR MORE COFFEE. We visited you in early November on my husband's 50th birthday trip and we are almost out of the wonderful coffee we purchased! We have finally made our way back to Sunny Mt. Airy, MD after one of our best vacations ever. You were a huge part of that experience! Thanks so so much for giving us a tour of your awesome plantation. We look forward to experiencing the Ka'u coffee. We will spread the word!!! Hope to see you next year! My brother is a local who raves about your coffee and said it is a must for the shop. I just ordered 3 different 1/2 pounds to cup. I look forward to the tasting. A couple months ago my daughter Emma and I were sitting around the house drinking your coffee and Emma was telling me she thought Hilo coffee was the best. She's worked and trained as a barista so I paid more attention. I bought some local tea and four coffee plants. Now I'm back in Oregon…I have the book Growing Coffee in Hawaii. I've read and reread it. Anyway, I just wanted you to know what a good time we had and how often I think of you folks and your business. Aloha, we always buy all of our coffee from you and recommend visiting your shop to any tourists we meet. We have family coming from the mainland and they were hoping to see a coffee farm - we definitely plan to take them to the Hilo Coffee Mill. i was there over Christmas and bought some coffee to bring home.IT IS DELICIOUS !!! !I will be interested in buying more (I assume you will mail or UPS it).I haven't looked at the entire website yet but will be.I am glad that I wont have to wait until I come back to get more coffee at home! Hi, I enjoy your decaffeinated coffee and because I live in Hilo, I buy your coffee. Aloha e Kathy… I'm so glad you've decided to add the Mele Kalikimaka Java to your list of other great coffees we can enjoy all year. I had mentioned to you how much everyone had enjoyed it when I brewed it fresh ... I had also given some as gifts last month … in Orlando and heard back from the cousins there how much they love it!! I was fortunate to be in your store last week on a tour with a group from Nebraska.I was also fortunate to have bought some of your coffee. hi kathy: it's been a while since we last spoke, and i hope this finds you well. matt and i decided last night that with the holidays coming around again, we need to put in another order for your fabulous ka'u coffee! i was going to put an order directly through your website, but i wanted to say hello as well.